This bread should be a simple one-day bread; however, I'm single-parenting this week and life got in the way...twice, actually. So the bread got two rests in the fridge: one for the bulk fermentation and one just prior to baking. Also, since I only needed one loaf, I scaled the recipe (which makes three loaves) back. 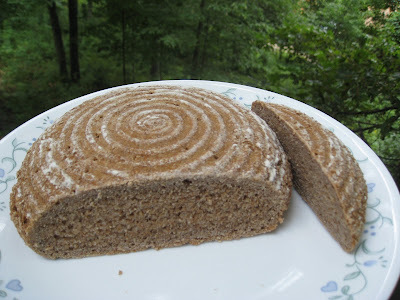 The bread is made by mixing oatmeal (soaked briefly in the water to soften it), high gluten flour (I used bread flour and a little vital wheat gluten), whole wheat flour, milk, honey, oil (I used safflower), salt, instant yeast, and ground cinnamon. The raisins (which have also been soaked in water to prevent burning during baking) are added at the end. This is the first time that I've seen a cinnamon-raisin bread where the cinnamon and raisins are baked right in the main part of the dough, rather than done as a swirl. JH says that a 1.5 pound loaf should fit in a 9x5 pan; my loaf was about 780 g (so a little over 1.5 pounds), but despite a really, really long rise, the pan still seemed too big. (My 9x5 has often given me problems; I think it's actually a little bigger than normal.) Next time, I'd use one of my bigger 8.5" loaf pans. I brought this bread up to the cabin with me, and we had a little taste before assembling the French toast. I think we were all a little disappointed. The cinnamon and raisins were definitely both present, but, as my dad said, "There's just too much bread flavor getting in the way!" My stepmom added that, if she's going to eat cinnamon raisin bread, she wants the sugar in there, too! So I think we all agreed that cinnamon raisin bread needs to have the traditional cinnamon sugar swirl; I doubt I'll make this one again. UPDATE: I take back my "meh" report...this made delicious toast (with a little butter) for breakfast this morning! It's flashback time for me. Let me take you back to January with the Mellow Bakers' three-stage sourdough rye. This bread has more time and temperature requirements than any other bread I've ever baked, and since most of the temperatures required are around 85º, I was not willing to try it in the midst of winter in the frozen tundra where we live. The other day, however, my kitchen table maintained a pretty constant 85º all day long, so I was able to make this bread without stressing over creating the perfect bread environment. 1. Freshening: combining a teeny tiny bit of my rye starter with water and more rye flour to create a paste, which ripened for five hours. 2. Creating a basic sour: mixing the freshening paste with water and more rye flour to create a stiffer starter, which ripened for about 18 hours. 3. Creating a full sour: mixing the basic sour with water and more rye flour to create a stiffer than the first, looser than the second, paste that ripened for three hours. 4. And finally, mixing all of the other ingredients: full sour with more rye flour, bread flour, water, and salt. I heeded the other Mellow Bakers' advice and left out the optional commercial yeast. The dough is very paste-like, so I used my wet hands to knead it briefly, and then let it rest for its short 20 minute bulk fermentation. Because I'd only made a half-recipe, I didn't divide the dough. I just floured my board and shaped the dough into a round, which I placed in my round banneton. Following Joanna's advice, I ignored the instructions for an hour final fermentation, especially given the fail I'd had earlier in the day. I let the dough rise fully, for probably close to five or six hours in an 80º room, before docking the dough with a bamboo skewer and baking it at 480º for 10 minutes and 410º for 35 minutes. The bread appeared to have very little, if any, oven spring, but I'm guessing it's because it had such a long rise time. As for the flavor? I don't know; I haven't tried it yet. =) My dad is the one who loves the dark ryes, and he was on his way to a cabin for a week when the bread came out of the oven. So I wrapped it in linen and sent it with him. His report after about 36 hours of waiting: "Bread is less complex than some of the other dense breads you've made. No embedded grains, seeds, etc. Predominant flavor is sourdough, with a strong sour. I will certainly eat it all, in the morning, with butter, but don't feel like you need to make this again soon." I'll have a chance to try it when I join him at the cabin on Wednesday. It feels good to be caught up, finally! Here are the other Mellow Bakers' three-stage sourdough ryes. Happy Sundae Sunday! My friend Di is hosting a virtual ice cream social today, similar to the cookie exchange she hosted last winter, to celebrate July being National Ice Cream Month. I only recently purchased an ice cream maker, and while I've been using it a ton, I've gotten many of my recipes from other bloggers who are attending the social. My challenge: finding a recipe that someone in the group hadn't already posted. At first, I made a strawberry cheesecake light ice cream, which was pretty tasty. But I was desperately craving chocolate.... I read up on all sorts of unusual chocolate ice creams: ones with cayenne, coffee, cherries. But I was really in the mood for chocolate-chocolate. And then I remembered my most recent issue of Cooking Light and a recipe for chocolate pudding pops. Score! These taste exactly like the chocolate pudding pops we grew up with: a perfect tasty treat for a 95º afternoon! 1. Combine the milk, sugar, cocoa, cornstarch, salt, and egg yolk in a medium saucepan. Whisk continuously over medium heat for 8 minutes, or until the mixture is bubbling and has slightly thickened. 2. Off heat, add chocolate. Let rest 1 minute and then whisk in. Add vanilla. 3. Pour mixture into a bowl set inside a larger bowl filled with ice water. Stir occasionally until cooled. Check here for the round-up of all of the Sundae Sunday tasty treats! Being already overwhelmed with my commitments to The Modern Baker Challenge and Mellow Bakers, I was not eager to join a new baking group, so when Kayte and Phyl started baking through Nick Malgieri's Bake! I was happy to sit back and watch........Until the recipes they were baking and posting became more and more irresistible, as did the fun they were having with their Twitterbakes. I am so happy that I caved and requested Bake! for my birthday, as it quickly became one of my very favorite cookbooks. But, because I joined in late, there were several recipes that I missed, and the group has decided to use the month of August to catch up. My little guy saw me writing "soup" on our weekly dinner calendar and requested a bread: "white with flour on it." (He means something along the lines of ciabatta or baguettes.) I thought back to the first recipes the Bake! group made and realized that I'd never gotten around to tiger rolls; they seemed like a perfect accompaniment to soup. This recipe uses NM's one-step bread dough, a bread made with bread flour (I subbed in some white whole wheat flour), salt, active yeast, water, and olive oil. The method is very similar to the unkneaded six-fold French bread that I just made: mix, stir, rest, stir, rest, fold, rest, fold, rise. It was very quick and easy. After its rise, the bread is divided into twelve rolls (mine were about 64 g per roll), and then it's time to mix up the topping that gives tiger rolls their name. This is a Dutch crunch, as we made for the BBA's Vienna bread, although this time I actually went out and purchased rice flour. The topping is made from active yeast, water, sugar, salt, olive oil, and rice flour, all whisked together, allowed a brief rest, and painted on the rolls. The rolls rise for a bit and then are baked for 25 minutes. This recipe was incredibly quick: 2:00 start time, 5:30 dinner time, and even allowed us a quick trip to the park. We all loved these rolls; with a little butter, they were perfect with our soup, crunchy crackly crust, fluffy inside. I planned to use the rest for sandwiches for lunch tomorrow, but my little guy asked, "Mom, can we have soup and tiger rolls for dinner again tomorrow?" so I guess it's leftover night at my house! Here are Kayte's tiger rolls, Phyl's tiger (or giraffe) rolls, Andrea's tiger rolls. Here's my last Mellow Bakers' bread for July: olive levain, the first fail I've had in a while. The bread is made with a liquid levain (left out for 12 hours), bread flour, a little whole wheat flour, salt, and water, and then some olives are added at the very end of kneading. My kids love olives but aren't fans of sourdough, so I just made a tiny loaf again. It had a 2 1/2 hour bulk fermentation and then went into the fridge overnight. I tend to let pure sourdoughs (ie, without any extra added yeast) rise for much longer than JH specifies because I've had this problem before. However, I know from other breads in this book that the loaves can be baked straight from the fridge, so that's what I did. There was almost no oven spring, and when I cut it later, the texture was not good; it reminded me of one of my first-ever attempts at baking a basic sourdough. Although it reached an internal temperature of over 200º, it did not look cooked; the inside was doughy, gummy, yucky. I think, despite the texture issue, that the bread tastes how it's supposed to: very strong sourdough flavor, clear salty olive taste. I'm sad that it didn't turn out, but given the flavor combination, I doubt I'll try it again. Just could not get excited about this Mellow Bakers bread, so I scaled the recipe down and made one small loaf. Even my hubby, who normally looks forward to pretty much any new recipe I make, said, "You know, you can't just dump walnuts and raisins into a recipe and call it something different. This is just like all of the other sourdough ryes." I think we're both getting a little tired of this genre of bread, even with some that have been surprisingly good. With a constant heat index of 110º F for the past three days, I couldn't bring myself to preheat the oven and my baking stone for an hour, so I decided to bake the bread at a lower temperature in a small loaf pan. It baked for 30 minutes at 350º F, and, with no steam, it was one of the most anemic-looking loaves I've ever made. We tried it toasted, with a little butter; the sourdough, rye, raisin, and walnut flavors were all very distinct. It seemed a little weird to combine the sweetness of raisins with the strong sourdough rye flavor, and hubby called the walnuts "startling" (not in a good way). At any rate, it wasn't bad, but we were not big fans. Browsing through my newest issue of Cooking Light the other day, I spotted a recipe for tuna melts with avocado. I almost always order a tuna sandwich when we eat out at a diner or sandwich shop, but I wasn't sure how my family would feel about it. I read the recipe to hubby and asked if it was something I should just make for myself or if it was something he would be willing to try; he said to go ahead and put it on the family dinner list. The recipe calls for French bread, so I immediately turned to my bread books to see which recipe I should make. I happened to find one French bread from Hamelman's Bread that the Mellow Bakers haven't made yet, and loving to find one recipe that meets two goals, I jumped on it: unkneaded, six-folded French bread. This bread is perfect for anyone who is scared of the kneading process and/or doesn't have a stand-mixer. It's a fairly quick recipe: I started gathering ingredients at 11:40 this morning, and we were sitting down to eat our sandwiches at 5:40. But while it's not difficult, it is fairly limiting: once you start, you pretty much can't leave the house. Check out the process; it's fascinating: first, you place your ingredients into a mixing bowl (bread flour, water, instant yeast, and salt). You don't mix with a dough hook or knead with your hand; you simply take your bench scraper and, turning the bowl as you go, fold the ingredients over on themselves 20 times. Then you let it rest for 30 minutes. Then you do the same thing six more times: fold the ingredients (which rapidly become a normal-looking dough) 20 times and rest for 30 minutes. That's it. At the end of this bulk fermentation, you shape the baguettes. I followed this video again. (I'd scaled the recipe down and made three baguettes of about 300 g each.) They rest for an hour (conveniently just enough time for the oven to preheat) and then bake; mine were done in 20 minutes. The loaves were perfect with the tuna sandwich, and the family easily polished off the rest of the loaf that was sitting on the counter. The texture was pleasantly chewy with a crackly crust. It wasn't the best baguette we've ever had in this house, but it was really, really good bread, and definitely the best one-day baguette recipe I've ever made. 2. Combine olive oil, shallots, mustard, pepper, salt, and tuna in a bowl, stirring well. 3. Juice the lemon into a bowl. Add the avocado pieces and toss. 4. Add avocado, juice, and tomato to the tuna mixture. 5. Place baguettes pieces on a baking pan. Distribute the tuna mixture evenly. Sprinkle with 1 - 2 tbsp of shredded cheese. Kayte organized another Indian dinner for us to cook this week, although I think Margaret and I may have been the only two to cook it tonight. Front left is the saffron cream sauce. I have never cooked with spicely gold before, and when I was at the grocery store this morning, I initially decided to skip it: $17 for a tiny bottle?! When I got home, I did a little research (no substitutions and a little goes a long way) and my hubby convinced me to try it, so back to the grocery store I went. When I got home and was mixing up the sauce, I realized that I also didn't have any cardamom, so I substituted garam masala. We really, really, really loved this sauce, both on the chicken and the naan. Center is the barbecued chicken. I'm not ambitious enough to cook lamb, as the original recipe calls for. The marinade is yogurt, sesame oil, and a lot of spices. I marinated the chicken pieces for about three hours and then hubby grilled them. The chicken was really moist and flavorful...again, we were big fans (the kids were, too). Back right is our normal naan. Yum! And for the first time, the kids actually ate theirs, too. Front right is a cucumber raita, something I've been curious to try, especially since I am a big tzatziki-lover. I'm not sure why, but the spice combination was just not good to me; I couldn't eat it and ended up throwing most of the bowl-full away. Hubby liked it okay with the chicken, but not enough for seconds. Well, another fear bites the dust and another item checked off the must-learn-to-make list: croissants! Like puff pastry, the fluffy layers of croissants are created by lamination: folding dough and butter over and over to "create many thin layers that puff when baked." Unlike puff pastry, croissants use a yeast-based dough. I used Peter Reinhart's recipe from Artisan Breads Every Day. The starting dough for croissants is called a détrempe, made by stirring together flour (PR gives the option of bread flour for structure or all-purpose flour for more tender structure; I used a combination of both), salt, sugar, instant yeast, cold milk, and melted unsalted butter. PR says the dough will be sticky, wet, pliable. Mine was dry and crumbly. I added a bit more milk, kneaded with my hands (even though he warns against handling it much) and stuck it in the fridge. And then re-read the recipe: ahhhhhh AND WATER. Right. Not wanting to mess around with a first-time recipe, I just dumped my first attempt and tried again, this time using the right amounts of both milk and water, and ended up with a dough that was just as he described. So that went into the fridge. The instructions are long and relatively complicated (7 pages), but also very explicit. I was actually startled by how easy it all was: roll, measure, fold, rest, roll, measure, fold, rest, roll, measure, fold, rest. Even cutting out the croissants was easy once I figured out the process PR was describing. Rather than rolling out the entire piece of dough into a 7" by 30" rectangle, I cut it in half. For half of the dough, I followed the instructions for making small croissants. (I ended up with eight.) For the other half, I followed the instructions for chocolate croissants, using a homemade chocolate bar for the filling (3 tablespoons of unsalted butter melted and combined with 1 cup of chocolate chips). I tried following PR's dimensions: 3.5" by 6" and they were huge so for the rest, I cut them in half. I ended up with two giant chocolate croissants and six smaller ones. I let the croissants rest in the fridge overnight and then let them rise for two hours in the morning. They baked for about 28 minutes and, even though I'd followed PR's directions for making "small" croissants, they grew huge in the oven! And, even though I know from making scones that when I try to bake two pans at once, they burn, I baked two pans at once...and the bottoms definitely scorched. Luckily, because they're so flaky, I was able to flake off the burned parts. These were really yummy, flaky, and buttery. But the chocolate ones were even better; I was really sad that I didn't make more. I also discovered that my family is not all that crazy about croissants, although they were pretty popular at bookclub. The next recipe that I baked from Nick Malgieri's Bake! was devil's food bombe, chosen by Margaret to celebrate her birthday on Father's Day weekend. We were out of town that weekend, and when we returned, I just didn't have a cake-worthy occasion; hubby and I do not need a giant cake just sitting around waiting to be eaten. So when my mom and stepdad agreed to come over for dinner tonight to celebrate their 29th wedding anniversary with us, I figured it would be a good time to try it out. Hubby hates raspberries (I know, crazy, right? ), so I had him pick up some strawberries to use instead. Happily, Kayte had already made this recipe and scaled it down, so I just used her math: half the cake recipe fit two six-inch pans and perfectly filled a 5.25" tall, 3.25" deep bowl (my 1 quart glass mixing bowl). The cake was easily thrown together last night, with unsweetened chocolate, boiling water, white sugar, brown sugar, flour, salt, baking soda, safflower oil, sour cream, vanilla extract, and an egg. My two six-inch cakes baked for 32 minutes and popped easily out of the pans. After cooling them, I wrapped them up and stuck them in the fridge, figuring they would be easier to cut if they were chilled a bit. This morning I assembled the cake, which only took about 25 minutes. The cake is thinly sliced and then patched together to line the bowl and separate the layers. In between the layers of cake, I dolloped sweetened whipped cream (I made a half batch, which was 2 cups of whipping cream, 1/4 cup of sugar, and 1 teaspoon of vanilla extract, and I had quite a bit left over) and strawberries. NM gives the option of sprinkling rum, too; I was curious about the flavor, but didn't want too much alcohol since I knew I'd be serving the cake to my kids, so I just sprinkled a tiny bit on the outer layer of cake and none of the rest. I had about 1/2" slice of cake left, which fit perfectly as a cap over the top. Then the cake went into the fridge until this evening, when I dumped it out of the bowl and finished it with more sweetened whipped cream. My mom took her first bite while I was photographing the cake outside and all I could hear was, "Oh my! Oh my! Oh my! This is sooooooo good!" Seriously, this cake was ah-maze-ing. The devil's food cake was moist, chocolately, with just the hint of rum. Together, with the whipped cream and the strawberries...well, I just don't have the words to describe how good it was. The little girl said, "Mommy, this was the best cake ever of my life." And hubby said, "Next time I have to take something in to work, this is what you're making!" Thanks, Margaret, for such an excellent pick! Our Twitter avatar chef for July is Ina Garten, otherwise known as the Barefoot Contessa, and Phyl picked her. I'm glad he did because I've heard a lot about her, but have never tried any of her recipes (unless you include my granola bars, which are an amalgamation of a ton of recipes including this one by Deb at Smitten Kitchen, who says hers were an adaptation of Ina's, but that's pretty convoluted...). I had a long list of recipes to choose from, but eventually settled on something I could make with ingredients that I already had on hand: barbecue chicken and mashed potatoes. I followed the recipe for Ina's barbecue sauce exactly, although I cut it in half because I was running low on several of the ingredients and it seemed to make a lot. Indeed, I ended up having enough to thoroughly coat four large chicken breasts and still fill up a mason jar. It's an easy recipe: lightly cook some onions and garlic in oil until translucent. Then add a bunch of stuff (worcestershire sauce, honey, soy sauce, hoisin sauce, tomato paste, cider vinegar, dijon mustard, chili powder, cumin, and red pepper flakes) and let it simmer on low for thirty minutes. I'd forgotten to defrost the whole chicken which I have in the deep freeze, so I decided to just make chicken breasts. And then hubby had a bunch of chores around the house, so he asked me to bake the chicken in the oven rather than firing up the grill. I baked the chicken breasts, which had been marinating in the sauce for several hours, in a foil-covered glass dish for about twenty-five minutes, and then I broiled them for about five. They were perfectly done, and we really enjoyed the flavor. Even the kids gobbled up their pieces. I'm excited to try the rest of the sauce on future meats and meals. Hubby prefers smokier sauces, but still said this one was excellent; with my sweet tooth, this one was perfect for me. I tried to make Ina's buttermilk mashed potatoes to go along with the chicken. I boiled the potatoes, pressed them through my food mill, and then added the 1/4 cup milk and 4 tablespoons of unsalted butter that she calls for. At that point, she says to "add enough buttermilk to make the potatoes creamy"...but my potatoes were already beyond creamy. I ended up just adding a splash of buttermilk plus some pepper (she says to add a teaspoon of salt, but mine were already quite salty from the salted water). Even with these changes, the potatoes were excellent. 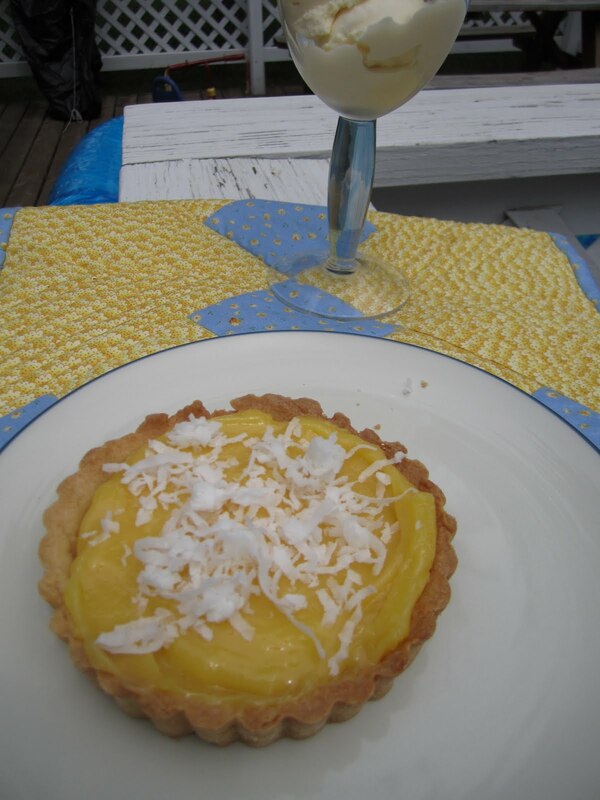 Ina's followers seem to be a devoted lot, and after these two winning recipes, I can see why! I have to dedicate this post to Di, who inspired me with her first Ice Cream Week post last week...until that time, I had never heard of Magic Shell. How is it possible that I've lived my life without knowing about this incredible substance? For anyone else who is in the dark like I was, magic shell is this chocolate coating which hardens instantly and smoothly when it comes in contact with something cold (ie, ice cream). Super easy to make and really fun to eat! I was intrigued as to whether I could make little bite-sized ice cream balls, completely coated in chocolate. It took some trial and error, but I finally figured it out. I was initially going to make my normal vanilla bean ice cream, but I was so pleasantly surprised by this weekend's lemon curd ice cream that I decided to expand my horizons a bit. Di wrote about salted caramel ice cream which has long intrigued me, and I happened to find a recipe for it on Bon Appetit, so I tried it. I'm always amazed when plain ol' white sugar ends up a perfect caramel, but that's just what happened, and it's just what the ice cream tasted like. Not a favorite for me, but fun to try a new flavor. There are a ton of recipes for magic shell out there on the web, with varying amounts of different kinds of chocolate combined with refined coconut oil (apparently the unrefined stuff makes food taste like Coppertone sunscreen, according to my most recent issue of Cook's Country). A few include a pinch of salt and several offer other flavoring options (which I may have to try at some point). I went with the basic recipe that Di posted, although I scaled it down so I only used one chocolate bar. 2. Make magic shell: partially melt chopped chocolate in the microwave. Stir until completely melted. Add coconut oil and stir until combined. Cool slightly. 3. Once magic shell is cool and ice cream balls have frozen fairly solid, dip each ice cream ball in the bowl of chocolate, rotating until it is completely coated. 4. Briefly refreeze coated ice cream balls. Ta da! Delicious and fun ice cream bon bons! I can't wait to try chocolate-coated chocolate ice cream....mmmmmmm. Wait! Haven't we seen this one before? We Mellow Bakers did, indeed, already bake a roasted potato bread back in October, and my family loved it. Needless to say, we were pretty excited to see this one come up: essentially the same bread but with the addition of roasted onions. This one starts the night before with mixing up a pâte fermentée and roasting potatoes and onions. All easy enough, except that I forgot I was only wearing one pot holder as I was dealing with the pan of hot onions and got a nasty little burn on my finger. The rest of the recipe is the same as the roasted potato bread (bread flour, whole wheat flour, water, salt, instant yeast, and the onions and potatoes). Easily made and baked in a morning, with a little pause in the fridge while we went shopping. I only made one 1.5 pound loaf and it flew off the dinner table. The little guy who never likes my bread ate thirds and the baby girl ate fourths (and both asked for another piece). This was a very flavorful bread. We ate it with this recipe for Tuscan roasted chicken which I bookmarked on Margaret's blog during our vacation. Instead of fennel, I used shallots, which appeared in our first CSA box yesterday. (We actually are on week 3 of our CSA, but were out of town for the first two weeks of it.) We finished the meal with a little fruit salad and a CSA-inspired salad. Quite a tasty summer meal! While catching up on Twitter yesterday morning, Kayte invited me to cook an Indian-flavored dinner tonight with several of our Twitter buddies. I'm always happy for new dinner ideas, especially in the summer when I have to plan three meals a day instead of just one! The recipes can be found here: Bal's no-butter chicken and Corn with aromatic seasonings. Both recipes were really easy to make, although I only had a bit of garam masala left, so I threw in some additional spices to make up for it. I wasn't super excited about the corn, but decided to make it anyway since we had two cobs leftover from the fourth. And I'm so glad I did; it was unusually spiced, but absolutely delicious! The chicken was good, too, but too spicy for the kiddos and me. The kids both took one bite, said "yum," then said, "water!!!" and then ate yogurt and cereal. I managed to eat a little, but it was way too spicy for me. I think I used too much cumin in my fake garam masala, and that there were too many pepper flakes for us. Easy fixes for next time! And hubby was ecstatic because he never gets to eat food that's as spicy as he likes! =) Cooking with friends and a delicious meal...what a perfect way to spend a summer evening! We've just returned to my kitchen home after nearly three weeks away, and my to-bake and to-cook lists have gotten insanely long while I've been away. We always spend two or three weeks with my in-laws in the summer. It is incredibly relaxing: my mother-in-law cooks amazing down-home meals (chicken and noodles with mashed potatoes, anyone?) and generally takes care of us, the kiddos play with their cousins for hours on end. It's such a great start to the summer. But after about a week or ten days, I really start to miss my kitchen. This is when I start bookmarking recipes like crazy and spend hours making a to-do list and a grocery list for my return. While we were in the car on our 17-hour drive home, some of my baking buddies decided to make lemon curd ice cream, spearheaded by Phyl. Tracey had posted a recipe on her blog, and she claimed to love it as much as her favorite ice cream, mint chocolate chip (also my favorite). As soon as we returned, it was the first thing I set about making. Happily, one of the few sweet tarts I have left from the Modern Baker Challenge was the lemon-lime tartlets, so I was able to make the lemon curd for those and use it in both. I made 2/3 of the recipe for the lemon curd, which was enough for one 4" mini-tart, 50 g for the ice cream, and a little bit left over. The curd requires lemons, limes, sugar, unsalted butter, and egg yolks. I couldn't find organic limes; I picked up one regular lime, but had an impossible time zesting it, so my curd was almost all lemon, with about 1-2 tablespoons of lime juice thrown in. The curd was a little time-consuming, but not difficult: put the lemon zests in lemon juice and sugar, simmer, and then allow to rest. After discarding the zest, add the butter to the pan and simmer again. Temper the egg yolks and then stir the whole mixture until thickened. I refrigerated the curd overnight. Last night, I also started making the lemon curd ice cream. I tempered the egg yolks with heated milk, and then thickened the custard...and then suddenly smelled scrambled eggs and realized that the temperature of the custard had shot from 150 F to 210 F in just a few seconds. I dumped the whole batch into the trash, grumbled a bunch, washed all of my dishes, and started over, this time being very careful to keep the custard at low heat and my eyes on the pan. It worked! I whisked in lemon zest and lemon curd and then refrigerated the whole thing over night. This morning, I whipped up some whipping cream and folded it into the lemon custard, along with some fresh lemon juice. This step seemed really fussy and I'd debated skipping it, but I'm so glad I didn't. This ice cream was the creamiest, dreamiest textured ice cream I've ever had. And the flavor was so light, lemony, refreshing. Even my little girl, who generally doesn't like fruit flavored things, said, "This is even better than vanilla ice cream!" and proceeded to lick every drop off the paddle of the ice cream maker. Hubby and I were both amazed by how wonderful this ice cream was...if you haven't tried it yet, and you have an ice cream maker, add this one to the list!